Specturm members Rene Rubalcava (left) and Camilo Anaza launch into a heartfelt song. 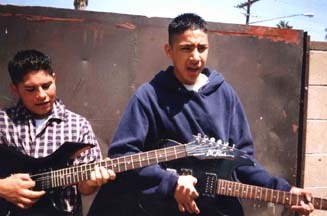 The four members of the band attend North Hollywood High. It’s 4 p.m. School’s out. Yet the day is far from over for North Hollywood High School junior Camilo Anaya, a musician in the local band Spectrum. He’s waiting for his dad to drive him to practice. The group, comprised of North Hollywood High School students, prides itself on performing for the hopelessly romantic types and has gained recognition in the past year as a result. Camilo grows impatient. He can’t wait to practice with the others. "We sing, not yell," he confirms. "Most importantly, we express the glory of love, not the eerie break up part." He then hums his favorite love song, "All for you," while waiting for his ride. He taps the concrete underneath him, following a rhythm only he and his band members can decipher. His ride still hasn’t arrived. He anticipates the scene at senior Rene Rubalcava’s garage, where guitarist, junior Solomon Huss, and drummer, sophomore Ruben "Tan" Rubalcava are surely tuning up. They get together after school just about every day to practice in the Rubalcava’s garage. "It’s outrageous how we feel on stage," Camilo adds. "It’s a surreal moment you just have to see to understand." He realizes Solomon and the Rubalcava brothers must be wondering where he is. It’s 4:10 p.m. He’s the one with the precious lyrics that will open the door to their fame. He has what they want, as well as what their fans can’t wait to hear. They can’t start without him – he’s a singer and guitarist. There is still no ride. Camilo can’t wait any longer. He has to walk to practice, which is two miles away. So we hike there together on foot. We finally arrive, and the band is ready to perform. In a little black notebook he guards close to his chest, like a mother with her newborn, are the eight-note lyrics that encompass everything the four of them have experienced with women. "[Women] drive me crazy," Solomon says. The group considers love a race against time because it’s so unpredictable. No one ever knows what to expect out of it, when it will start or when it will end. "A dull guy goes into love unprepared. But when he’s in it, everyone can relate to him," lead singer and bass guitarist Rene says. "That’s what we sing about—the passion that enthralls us when we least expect it." "Simply stated, Spectrum talks about what’s real!" Tan exclaims. Although many musical groups change their names over and over, the name Spectrum stuck with this four-man band, because they identify with the definition of a spectrum. "A dull light goes into a prism and out come the beautiful colors of the spectrum," Rene says. "That’s what we are—the colors of youth." They try out a few new songs: "I’m so far from you," "Your warmth" and "My world." In between breaks, they gleefully groove to their first compact disc sample recording with the songs "All for you" as well as their version of the Turtle’s "So happy together." Those two songs are the ones that will take them places, they explain. They listen to the Beatles, Sublime and Weezer—some of the artists that have inspired them this last year. Luckily, a well-known disc jockey helped them meet popular agents, like Epitaph Productions in Los Angeles. It’s past 11 p.m. and the band stops before the neighbors have a chance to complain. One time when the band first started out, they jammed until the wee hours of the morning. About 1 a.m., a neighbor wearing her nightgown marched right into their garage and said, "People like to sleep, too." The musicians apologized to her, and she walked away in a huff. Although they stopped playing, they just couldn’t turn off their flow of creativity. So they worked on lyrics instead. They recall that story with laughter and are about to wrap it up. But before calling it a night, they flip through photos from their first performance last December during a party at the home of Julio Orellana, a North Hollywood High School junior. They played before an audience of about 50 that night. Orellana is their biggest fan and is the one who helped them launch the recording project. Suddenly the phone rings. Solomon rushes to pick up. He says a couple of words, then smiles, thanks the person on the other line and hangs up. He looks over to his colleagues and says, "That was the man we met from Santa Ana. He wants us to play at his party with a few other punk bands on July 29. We’re in!" Awe-stricken, they stare at each other. Silence fills the room. Then, Tan says, "What are we waiting for? Let’s practice!" After a loud resonating laugh, they grab their instruments and begin.